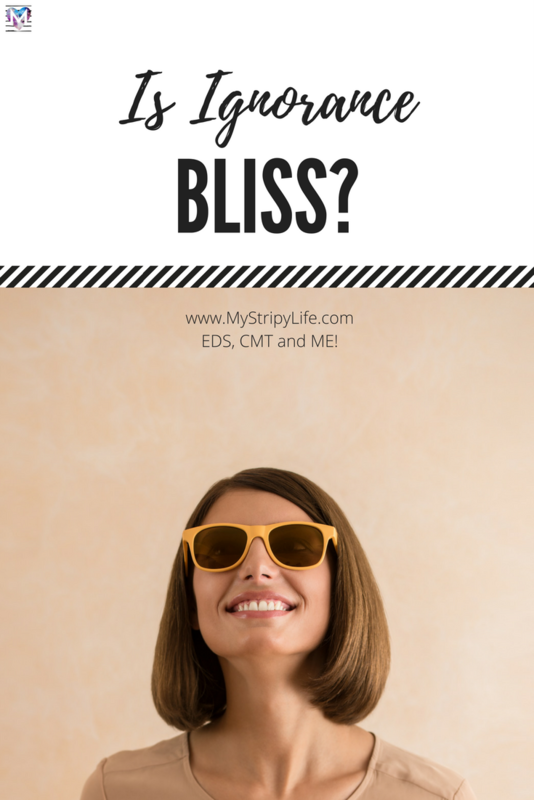 Is Ignorance Bliss? Or does awareness lead to enlightenment? I have been thinking carefully over the last year or so, as my children grow and I find myself fighting for their care and for referrals to the right doctors. In the hope that they might have the answers to their growing list of symptoms. Doctors have continually questioned our search for answers. ‘Why do you want to know if they have Ehlers Danlos Syndrome (EDS) they have a diagnosis of Charcot Marie Tooth Disease (CMT) anyway?’ Or ‘They are very unusual symptoms for their age, are they being bullied?’ or comments like ‘They are within normal parameters’. Are all these doctors right? Are we wasting our time? Did not knowing ever do me any harm? My medical records of diagnosis’ and mis-diagnosis would put the encyclopaedia Britannica to shame. Since the age of seven when I was first admitted to hospital with hip pain, unable to walk, my life has been a catalogue of seemingly unrelated illnesses, accidents and injuries. My mums favourite saying when I was young was that I was ‘full of things that nobody ever died of’. However I carried on until the next thing knocked me off of my feet again. I pushed on through school, A levels, Uni and work. After all what choice did I have, all the doctors were telling me that I was Okay. One day, I remember sitting in a staff meeting at the end of a day’s work, I was in my early 20’s, I can picture the room the memory is still so vivid for me. The ICT suite of a local primary school, perched on high stools in front of computer screens, sun streaming through half shut blinds. I was wearing trainers because I had got to the point where I couldn’t work a day in a pair of shoes. As I looked round, fidgeting constantly in an attempt to cope with the pain I remember the overwhelming feeling of how weak I was. I began to wonder, how could all these people cope with pain better than me? Why couldn’t I hack it? You see I have always had pain too some extent, I can’t remember a time that I haven’t, it has always been normal to some degree but I was beginning to admit defeat. Looking back it seems ludicrous now to say this but at this this point in my life I thought that pain was normal for everyone. It was over the next few years I began to realise that it wasn’t. It was at these points in my life that I did seek medical input. When my bowel really didn’t work at all. When my migraines were so severe I was having 3 or 4 attacks a week. When a piece of bone just broke off my knee cap moving in the bath one day. I quickly realised that when things calmed down each time no one was going to follow up or improve things for me long term. I had to learn to get on with it. Eventually in my 20’s and 30’s respectively, through investigations for entirely different things I was diagnosed with Charcot Marie Tooth Disease and Ehlers Danlos syndrome. When the final piece of this puzzle slotted into place I had an overwhelming sense of relief, happiness, I’d even go so far as to say euphoria. A sense that I wasn’t mad and light bulb moments kept coming over and over. However as I came to terms with what that meant for my children I found myself questioning was ignorance bliss? Did it do me any harm not to have a diagnosis for so long? Or would awareness make a difference? Would life have been any easier? I would like to think so. I would like to think that support throughout my school years would have been a little better. I had work sent home for me during my many hospital admissions and I remember quite clearly taking my mock A level exams on the geriatric ward in Hillingdon Hospital whilst on traction. But real support, a scribe for exams when my hands didn’t work, or extra time for rest breaks, that didn’t happen. I got was excused from PE for fear of dislocating, but was anything ever adapted to include me, not in my memory. I studied hard and I did go to University, my time their was tough, especially field trips, finals and dissertations (I did two)!! but I graduated with first class honours. I managed those four years without any adaptations which I am immensely proud of and embarked on a career in teaching which I loved. Would a diagnosis had made a difference at this point in my life, well, on one hand I got through it but on the other there was a pay off, one that I think I am still paying for now as the years that followed saw a slippery downhill path with my health. My career choice now is impossible to pursue. Would I have made better choices regarding my future if I had known. Most definitely. I am fortunate to have three healthy children who I carried to term without any major complications. I am thankful for this everyday. My pregnancies were the easiest part of having children as the hormones that I produced really minimised my pain for 9 months. However their were other unexplained complications; daily migraines, symphysis pubis dysfunction, falls, incredibly quick labours, blood loss, shock, nerve compressions and the fact that my body almost completely shut down three months after giving birth each and every time. These complications may not have been prevented but most certainly could have been treated more effectively if the people involved in my care knew what they were dealing with. The area of my life that would have benefited most from a diagnosis at an earlier age would be the way I have been managed. Particularly my muscular skeletal problems. Dislocations saw me put in plaster (my knee surgeon cringes every time she reads this on my notes) causing significant muscle wastage, major knee surgeries and the need for more in the future. Stays in hospital unable to walk left me discharged with no follow up care because they couldn’t get to the bottom of what was happening and 30 years later I still have daily hip pain. I never had the opportunity for orthotics or braces (even though I had foot surgery to correct some deformity) and I now require surgery to totally rebuild my feet. Could lots of this have been prevented if managed with a multidisciplinary approach at a young age? Yes. There are positives to living everyday with chronic pain, many qualities that I have mastered along this journey. I have the ability to paint on my smile and get on with the job at hand. I’m not a moaner and groaner. I look at life in a remarkably positive way and have learnt not to sweat the small stuff. Has this come out of not having a diagnosis or just part of living with chronic illness? I don’t know? So will I continue to search for the answers for my children, damn right I will. If I can make one element of their lives a little easier than my own then it’s all worth it. My own parents did not have the gift I have, the gift of knowledge, awareness that empowers you to make good choices and search for answers. 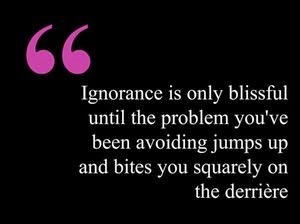 Is ignorance bliss? perhaps, when you don’t know. My parents did not know what was going on with me, I was born in an age without the World Wide Web, when you took what a Dr said as gospel just because they were doctors. No one connected the dots for me and that’s okay. In the last few decades things have changed a lot, we live in the age of information, and also in an age where the NHS is very specialised, with a multi-systemic illness it is inevitable that you will see many professionals and have to be responsible for the passage of accurate information between them. Now as parents if we did not do everything in our power to champion our children, if we ignored the reality of what we are faced with we would quite frankly be burying our heads in the sand. In this age of information ignorance becomes a choice. Professor Grahame one of the worlds shining beacons for EDS spoke at a conference last October and summed things up for the community, while great strides are being made he said that “People with EDS are badly let down by the medical profession. Patients are not listened to, believed, diagnosed or correctly treated. I know of no other disease where this is so.” Fortunately the picture for CMT is not quite so dark, but it further highlights the importance of advocating for yourself and your children. It’s not easy sometimes, but I will continue to raise awareness, support my children to make good choices for their future, nag them to do their physiotherapy exercises, run them to all their different clubs, chase up doctors secretaries for appointments, co-ordinate their ongoing management with therapy services and school and educate staff anywhere I need to in order to get them what they need. After all if we don’t as parents, who will? My sister in law works for one of the top 10 universities in the country co-ordinating the help that disabled students receive. Of the 1000 students she supports she says ALL have made it to university because their parents have been willing to put themselves on the line for them, to fight for what they need and guide them through the process. I don’t know what my children will choose to do or to be in the future but I will endeavour to help them to succeed. This is something I struggle with when dealing with my own issues. Do I even want to know when it seems like no one out there can help me? But there is great power in knowing! It brings the opportunity for change. Keep fighting, take care. Thank you for sharing. Rough couple of weeks for us. 14 yo triplets and myself dx EDS Type 3 around 2 years ago. Many issues (illnesses, injuries, more) at this time again. We're in a flare round I suppose. Sharing for others. I will keep fighting for my children as well.